That’s a slightly unfortunate choice of words because ‘Citroen Advanced Comfort’ makes the new C4 Cactus virtually shake proof. ‘Progressive hydraulic cushions’ at each end of the dampers, front and rear, absorb suspension travel at both extremities, allowing slightly softer coil springs to be fitted. Total travel is 80mm, with up to 60mm on compression and 50 on rebound. The cushions soak up oscillations, so the system absorbs road surface irregularities giving an extremely smooth ‘magic carpet ride’. It isn’t the same as Citroen’s oleo-hydractive suspension first seen on the rear of the Traction Avant in 1954, then applied to all four wheels of the legendary DS and adopted by Maserati, Rolls Royce and Mercedes Benz. This is a relatively simple system that, together with some other changes, will only add around £500 to the price of a C4 Cactus. Citroen didn’t stop at the suspension. Its ‘Comfort is the new Cool’ campaign continued to the seats that are made of a 60mm deep squab cushion of high density foam, topped with a 15mm layer of supple foam laid in squared patches. The massive advantage of this is the seats are immediately comfortable, support a greater area of the lower body, and keep the occupant securely in place without the need for raised side bolsters. Even after 5 years test use there was no deterioration. The seat remained exactly the same. Despite the huge advances in suspension and seating, the 2018 C4 Cactus is essentially a mid-life revamp. The lilo-like ‘air bumps’ are relegated to the bottoms of the doors making the car’s appearance less “divisive”. Options now include slot and parallel park assist, camera triggered active safety brakes, driver attention alert, ‘Connect Box’, ‘Connect Nav’, ‘Mirror Link’, speed limit recognition and recommendation, Grip Control with all weather tyres, 16-inch and 17-inch alloy wheels, and now PSA’s 1.2 Puretech 130 engine that with a 6-speed manual transmission gives the C4 Cactus a 0-60 of 8.4 seconds. There is also scope for customisation with 9 body colours and four colour packs. So the car most of us knew and some of us loved has now moved upmarket a touch, but it’s the comfort level that will find it the most friends. It arrives in the UK in Spring 2018. I have had a Cactus C4 1.6HDL Blue Flair addition for nearly two years.. I am a great admirer of Andre Citroen and his engineering. My Cactus as done everything that is required of it. The addition of this new suspension will make it even better as one who in the past as experienced the Citroen Pneumatic Suspension and kept on saying please bring it back. 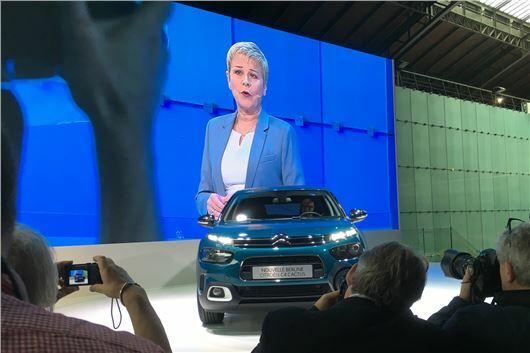 If we can use hydraulics in Farm Equipment and Construction Equipment so easily why not in cars?Well done Citroen looking forward to driving with it. The Cactus is a Great Car. IMO it is a sad day having owned a C6 and most of the other hydraulic Citroens including the SM. The new system may be comfortable but will never replace the carpet ride and handling with the old interconnected hydraulic and hydractive suspension. Maybe if Citroen had gone to the "riding on air" configuration as so many other manufactures have done they may well have had a game changer for the better. Does it come as an automatic?